Summary: We are going to look at some of the things that God says “MUST.” And when God says MUST we need to listen and do what He says. God’s Word is absolute truth, and as such it is undeniable. This lesson is a very important one. And when God says MUST we need to listen and do what He says. God’s Word is absolute truth, and as such it is undeniable. Folks, when God has spoken, we cease to speak. 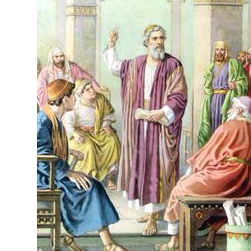 Peter began immediately to scold the Lord for saying such a thing. There are seven MUSTS in today’s message, and every one of them is God’s decree, and they MUST be just as He said. Let’s believe what He will tell us today by His Word. Jesus said, “Marvel not that I said unto thee, Ye must be born again” (John 3:7). When God says “must,” we certainly can’t afford to use a word that’s less insistent. Everyone who wants to see heaven, and to enter into heaven, must be born again. Salvation is not just patching up our old self, it is a new man created by God. Salvation is not just cleaning up the outside of the platter, but instead, it is the cleansing of the inside of the platter. Salvation is a new creation. Salvation is not a change, but it is a birth, a new birth; it is a second birth. There is nothing about the old nature that God will accept, because it is corrupt. And He doesn’t have any plans to improve it or to change it. The old nature is too weak to follow Jesus. Those who are controlled by the old nature cannot please God, and therefore they can’t serve Him either. We are given a description of the old man in the Bible, where it talks about those controlled by their old nature. The apostle John wrote, “As man lifted up the serpent, in the wilderness, even so must the Son of Man be lifted up” (John 3:14). This “must”, that Christ must die, stood before Jesus just as unavoidably, as “Ye must be born again” stands before every sinner. There was an eternal must that faced Jesus every day of His life. In fact, He faced it even before the foundation of the world; it was the “must’ of the Cross. But what was this compelling must that drove Jesus to Calvary? Did Jesus say, “The Son of Man must be killed,” because He saw the multitudes turning away from Him? Once the common people were glad to hear what He had to say. They had eaten His bread and His fishes; they had applauded the power of His miracles; they had applauded when He taught them about the things of God; but now they were leaving Him. We are going to look at some of the things that God says &#8220;MUST.&#8221; And when God says MUST we need to listen and do what He says. God&#8217;s Word is absolute truth, and as such it is undeniable.